Avalanche danger will be LOW today at all elevations and all aspects. There is a possibility of causing minor loose snow sluffing in steep terrain. Afternoon temperatures are expected to reach into the high 30s with sunny skies, so wet activity is possible on sun exposed slopes late in the day. Today looks like the last day of sunny weather before clouds, snow and rain take over. Get out and enjoy it while you can. Overall stability is excellent. At road elevation only a couple inches of snow from early in the week are on top of a supportable crust. The higher up you get, the more soft snow you will find. Shaded aspects seem to be holding the softest snow, and direct south has more variable crust to contend with. Yesterday it was possible to initiate low volume sluff in steep terrain. (see photo below) The ~8 inches of soft faceting snow tumbles away easily and will entrain snow below if the slope angle is around 40 degrees or steeper. The density of this layer is so light that even getting "caught" by it wouldn't be much of a problem. Warmer temperatures today with very little wind could start causing some wet avalanche activity late in the day. 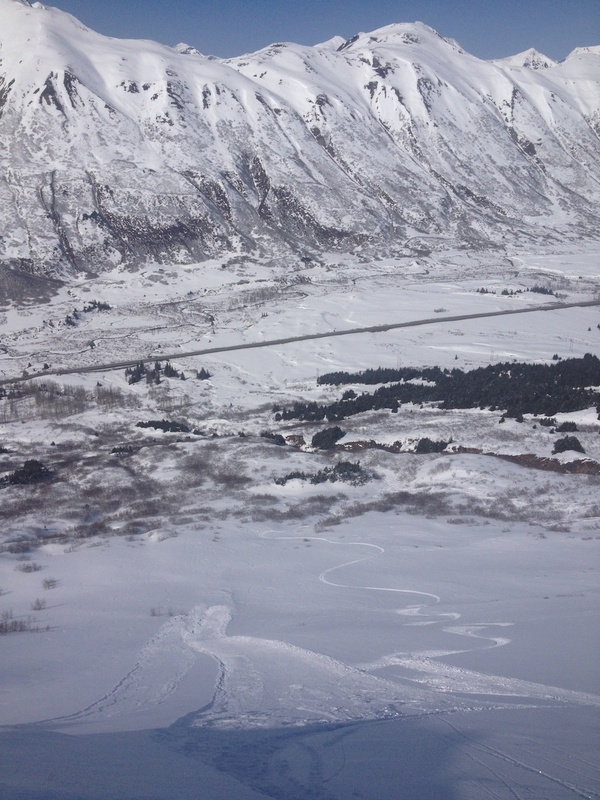 The last snowfall was on Tuesday when 6-8 inches fell around Turnagain Pass and Girdwood. Since then temperatures have stayed fairly cold, and generally below freezing. Today looks like another brilliant sunny day. Expect warmer temperatures. Overnight lows have already stayed about 10 degrees warmer than the last couple nights. Daytime highs are expected to break the freezing mark and reach the high 30s. Clouds tonight will lead to a chance of rain and snow for the weekend. The general pattern will be changing from sunny and stable to unsettled.